BOSTON, MA -- Another month finished in the Eastern Hockey League Premier (EHLP), as it's starting to really feel like the season is upon us. As the temperatures have begun to drop outside, the number of great matchups and performances have increased inside the rinks. 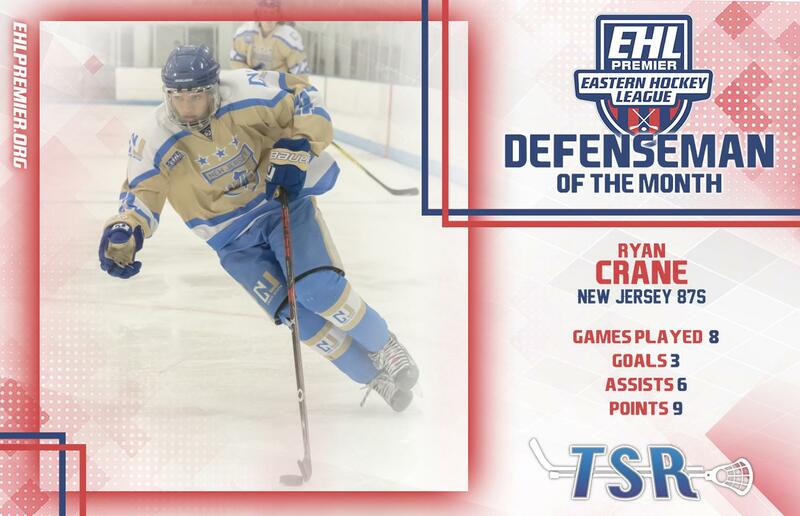 The month of October featured 55 total games, and many worthy candidates for our second set of TSR Hockey Stars of the Month. 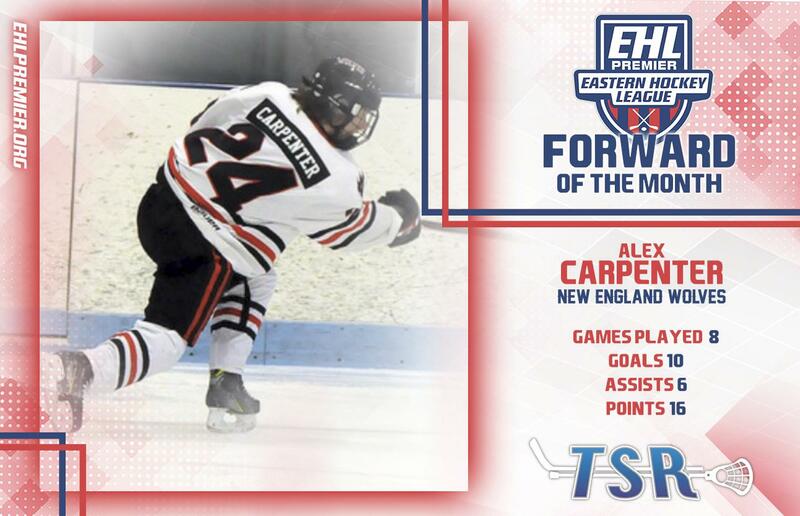 The EHLP is pleased to announce that Alex Carpenter (New England Wolves), Ryan Crane (New Jersey 87s), Bobby McCloskey (Boston Jr. Rangers) have been named the TSR Hockey Stars of the Month for October. Scroll down to read about each player's set of October performances, and remember to catch the #Eshow action all year long on HockeyTV. Flip over to the Mid-Atlantic Conference and we get a defenseman that just helped his team go 7-1-0 during the month of October. Crane dressed in all 8 games for his club, scoring 3 goals and dishing out 6 assists. For the season, the 2000-born native of Port Monmouth, NJ now has 13 points through his first 15 games. The October stretch truly got the 87s back on track, after they dropped 3 straight games at the end of September. Looking ahead to November, and New Jersey kicks-off a new month on Friday, by hosting the HockeyTV Game of the Week against the Philadelphia Revolution. Following Friday's battle for 1st place, the 87s have 7 more games this month, including a key home-and-home series with the Philadelphia Little Flyers. We wrap-up our newest set of Stars of the Month, with the top performer between the pipes. McCloskey made 42 saves and lost in a shootout during his first start of the month, at the hands of the Philadelphia Revolution. Following that defeat however, the 2000-born native of Marblehead, MA was almost unbeatable in his next 4 starts. McCloskey won all 4 games, all while turning aside 128 of the 131 total shots that were sent his way. For the year, McCloskey now owns a record of 6-1-1, to go along with a 1.26 GAA and .963 save percentage. 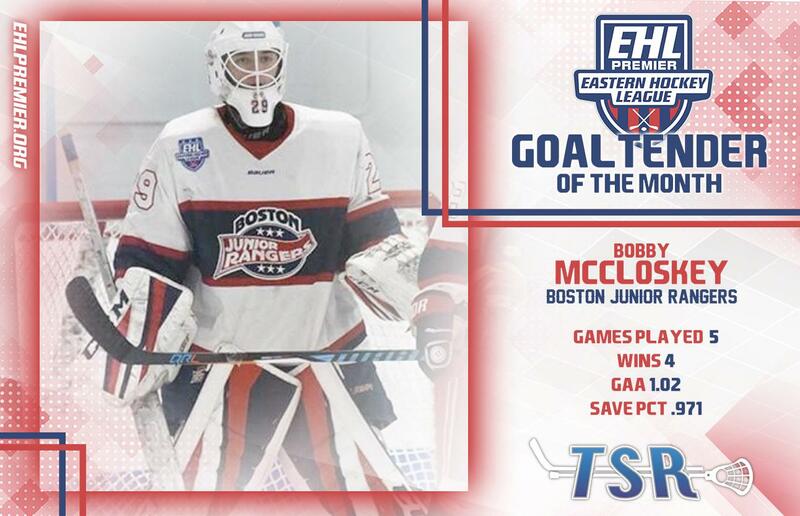 McCloskey is a key returning piece that is hoping to make it back-to-back championships for the Rangers, an organization that was already won 2 of the first 3 EHLP titles. The upcoming month features 8 more games for the Rangers, and pair of key series against the New England Wolves and the Vermont Lumberjacks.